Oppositional Defiant Disorder or ODD, is a condition characterized by a pattern of uncooperative, defiant, disobedient and hostile behavior toward authority figures, ordinarily parents and teachers. Teenagers with ODD regularly lose their temper, suffer uncontrollable outbursts, consistently rebel, argue with adults, actively defy rules, refuse to follow directions, and deliberately seek to annoy others. ODD is one of the most common mental health disorders found in adolescents and teenagers. Research suggests that as many as 16% of adolescents have some degree of ODD. Signs of oppositional behavior usually begins to exhibit itself in middle-school aged children and is more commonly found in boys at this younger age. However, by high school, or teenage years, the condition is equally common in both boys and girls. Parents of children with ODD often struggle with the idea of their child's behavior being excessive or age-appropriate oppositional behavior. Admission professionals at ERTP commonly hear the phrase "we're at our wits end" from parents of children with ODD. The Elk River staff are professionally trained to assess, evaluate, diagnose and treat ODD. In many cases, oppositional defiance disorders coexist with ADD or ADHD. Symptoms of ODD sometimes occur as part of a major depressive disorder, obsessive‑compulsive disorder, or an attack of mania. In some teenagers, ODD may represent a remnant of separation anxiety disorder, in which oppositional defiance reflects a reaction to feelings of ambivalence and anxiety that arise from the developmental move toward independence. There also seems to be a correlation between an adolescent with ODD and a family history of disruptive behavior disorders, substance abuse, or other emotional disorders. Elk River admission staff gather extensive background information from parents and/or referral sources as part of a collaboration to gain a clear picture of the patient. In treating teens with Oppositional Defiant Disorder, the multidisciplinary treatment team at Elk River Treatment Program (ERTP) first begins treatment by performing evaluations, conducting assessments and monitoring the child around-the-clock to develop an accurate diagnosis. Once the diagnosis is determined or confirmed, a comprehensive treatment plan is developed by the treatment team. The residential environment and experienced adult staff provide clear and concise boundaries on a consistent basis which is extremely effective for individuals with ODD. 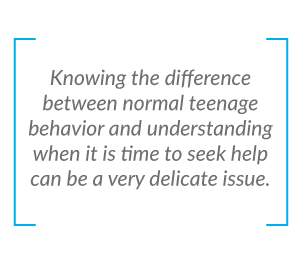 Teens just entering the program often claim that their behaviors are normal and acceptable and that everyone else is out of line. They typically blame others for their mistakes. They may appear touchy, angry, resentful, spiteful, or vindictive, even to their peers. Although aggressive behavior tends to be limited, some adolescents engage in physical aggression, and their language tends to be more aggressive and obscene than the average teenager. After entering Elk River Treatment Program, teens with Oppositional Defiant Disorder learn to identify behavior that is unacceptable, accept responsibility for it, and uncover the core issue that drives the behavior. A core issue is a traumatic and/or extremely painful event one experiences over which he/she had no control, can do nothing to change, and results in a significant loss. Elk River counselors agree that most painful losses occur within the family. Once the core issue is identified, residents learn to use tools to identify the old feelings, realize the behavior that results from those feelings, and replace the negative behavior with new, positive behaviors. Frequently teenagers with ODD are struggling in school both academically and socially. At Elk River Treatment Program we provide a fully accredited academic program for grades 6-12, that offers a customized curriculum for your child in a therapeutic environment that is more conducive to learning than traditional classroom settings. Research suggests that children develop symptoms of ODD as a way to deal with anxiety, uncertainty and stress. Therefore is is quite common for teenagers to exhibit anxiety and mood disorders as well. Among all the conditions to coexist with oppositional defiant disorder, the most common is ADHD. Adolescents that have both ODD and ADHD tend to be more aggressive and have lower performance in school than children that have ODD by itself. Doctors have also found that ODD can be a precursor to a more serious condition of conduct disorder or CD.